← Miromesnil We’re Moving In! The place we rented in Paris was a little far away from all the tourist activity, but it just happened to be right near the largest weekday market. It was more than four city blocks long with varieties of mushrooms I’ve never seen before, fish, beautifully displayed vegetables and fruits, breads, wine, cheeses, lots of take home dishes, as well as snails, cow tongues, fish heads, little birds, rabbits, pig feet and everything one could imagine that might be edible. It was inspiring to see so many young and old people with their sacks loaded with their ingredients for the week. It’s a way of life here and, well, taking a hold in our own country. David and I picnicked in our room with ratatouille, cheeses, a basil and lemon tapenade, bread and wine. Best meal we’ve had so far. Last day in Paris we finally got our travel legs. First priority was the Marmotan Museum—out in what we would call a suburb—it’s a private collection of Monet and other Impressionists. We took the metro but still far from the museum. Dummy country bumpkins! We didn’t even know how to hail a cab. I wish I had more of a vocabulary to describe or know something about art. Monet’s pieces were ones we rarely see. But he takes you to a perfect moment – on the Seine River, the shimmering light on the water, luminescent weeping willow—well, just nature in all her joyous vibrating beauty. With all the horrible things that happen in the world, it is encouraging, uplifting to know this being (Monet) came on earth to share his sense of beauty with all of us for generations. We sat for hours with just 3 or 4 of the paintings we loved. Then after a quick metro ride, had the most expensive and worst meal in the tourist section of Paris. (nothing is ever perfect). Finally took the boat down the Seine to see the Eiffel Tower and great architecture. History came alive as the young woman explained much of what happened in these buildings. 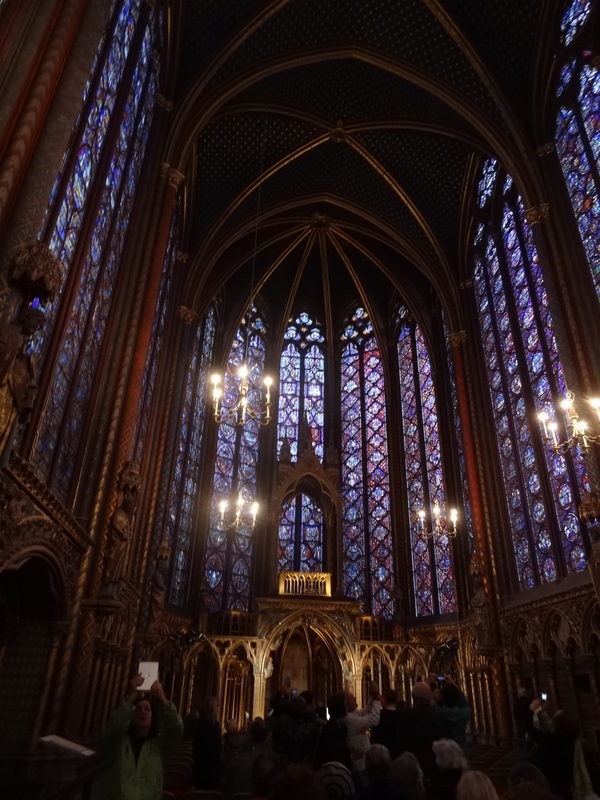 Then we dashed (actually I was dragging myself) to the Saint Chapelle cathedral —just happened to get there as they were lining up for a concert—a choral octet with a small orchestra. This church is reknowned for some of the best stained glass in all of Europe. It also just happened to be fashionista week in Paris. Models were in the park and in this one plaza where david and I just happened to walk by. We tried taking photos, but the professional photographers were no match for us. 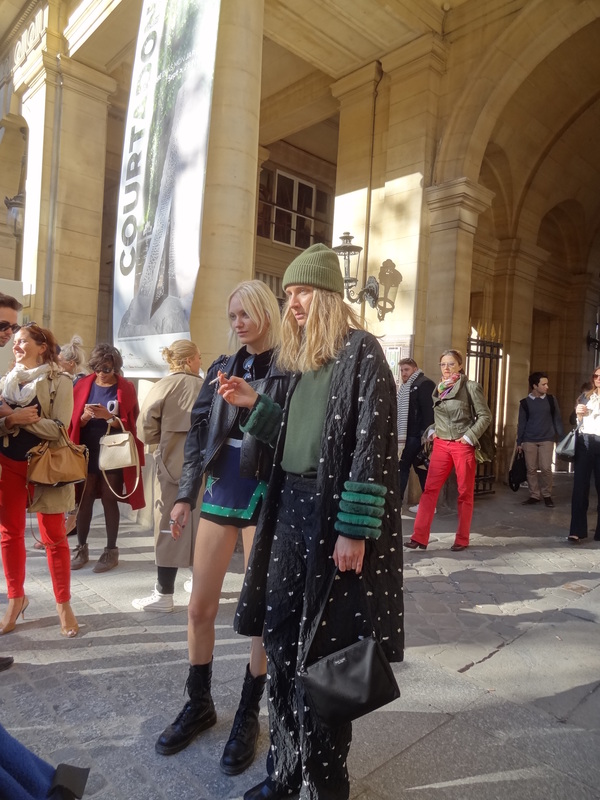 Fashion is a little over the top in france—sort of like health food in California. This entry was posted in Saint Chapelle Cathedral and tagged Fashionista week, Paris. Bookmark the permalink. So glad you are having fun. I so much enjoy your impressions as you travel. You are my personal Pico Iyer!! Picola??? I am enjoying your travels. I like the way you go off the “beaten” path. So exciting. Glad you’re having such fun. Keep trekking!